​​Fashion and jewelry journalist, Adrienne Weinfeld-Berg looks back at some of the highlights of Jewelry Television’s Gem Lovers Conference, held in Knoxville last July. ​The three-day event for JTV’s clientele kicked off with the Gem Lovers’ Appreciation Dinner and Fashion Show. This glittering, fun-filled evening featured many of JTV’s Show Hosts, who walked the runway, decked out in chic black and white clothing, wearing the network’s signature jewelry. The next morning, at the GLC, JTV joined forces with internationally-renowned gemstone experts who gave seminars to customers, enthusiasts, serious gem hobbyists and designers on the latest topics relating to gemstones and jewelry. With its largest event yet, GLC’s sessions were conducted by more than 40 world-renowned experts, and spread out over four venues, including suites in two neighboring hotels. Presentations of three very different topics are summarized here, followed by mention of some of the other interesting speakers. Battling weather, rock slides and human greed, prospectors in Colorado risk their lives at dizzying heights to find precious gemstones. Is the risk worth it? The prospectors think so, and their gem finds prove it. The most popular show on The Weather Channel, Prospectors features fearless miners as they struggle to find the mother load. One of the most popular stars of this reality series is Amanda Adkins, who began mining and selling gemstones in Colorado before she was a teenager, and who gave the presentation Stories from the Mines. “It started when my father and my cousin took me on their gold panning and gem prospecting trips,” she reminisces. “I was fascinated when I saw the tiny flakes of gold in my pan.” Soon, however, her attention turned to the brilliant red gems that also turned up with the black sand and gold in the pan. “I would keep the gems in a small vile and show my father and cousin, who just smiled, telling me that the red gems were January’s birthstone. While the gold was fun, I found hunting gemstones to be much more interesting. I was hooked.” And, Adkins has been hooked ever since. She always stands her ground in a largely male-dominated profession and never has problems going head-to-head with any prospector in the field. Today, more than in the past, she adds that claim jumpers have become an even greater threat than the weather, since they try, sometimes violently, to horde in on prospectors’ claims. After 24 years of prospecting, Adkins has gained a wealth of experience and has made several large discoveries thanks to her innate ability to read rocks and dirt like a book. “I know just where to start digging,” she smiles, “to unearth rare and beautiful gems.” Over the last two decades, she has gathered the inventory, buyers, and resources needed to make prospecting a true full-time job. Adkins also appears on JTV, where she is the voice for American-mined gemstones for the American Splendor Collection. Truth be told, Charles Winston is known internationally for his one-of-a-kind jewelry designs and his famous tagline, “Jewelry for the Celebrity in You.” Inspired by his fashionable, Cornell-educated mother—a physicist who worked on the Manhattan Project and loved big, important jewels—Winston entered the jewelry industry via the family business at the age of 17. He quickly developed a keen eye and a high regard for quality, style and luxury, thinking that all women should be able to afford elegant creations of fine jewelry. Winston later formed his own jewelry company, manufacturing stylish pieces in sterling silver or gold, but incorporating cubic zirconia in lieu of diamonds, as well as lab-grown gemstones instead of their natural counterparts. Following the success of his CZ collection, Winston recognized the need to step up from that, yet still provide beautiful and affordable jewelry. In 2010, he partnered with Charles & Colvard, the sole source for Moissanite, and today he is recognized as a leading designer of cutting-edge, high-quality Moissanite, CZ—and diamond—jewelry. In 2011, he partnered with Jewelry Television to create an exclusive and affordable Moissanite Collection. Understandably, his presentation at GLC focused on the ins-and-outs of moissanite jewelry. For Winston, maintaining an up-close-and-personal, friendly and good-will connection with his customers, whether on the air, the website or social media, is important. And, he put his money where his mouth is, so to speak, during each of his seminars at GLC, by raffling off a luxurious pair of 14K-gold stud earrings set with Moissanite. Mitchell recounted many twists and turns about the power, wealth, and precious gems of the English Monarchy throughout history: Crowns, Coronation Regalia, and other Jewels, while weaving in the skullduggery, mystery, intrigue, horror and thievery that often accompanied these royal gems. Mitchell also told stories about Colonel Thomas Blood’s foiled attempt to steal the Crown Jewels in 1671. She also described how onlookers visiting the Jewels in the 18th century were locked into a windowless, gloomy, candlelit room in the lower Martin Tower, where they could only view the regalia through narrow bars. However, for a small fee, visitors could reach through the bars, touch the Jewels, and even try on some of them. Then, in 1841, when a room adjacent to the Jewel House caught fire and no one could find the keys to the Jewel House, Mitchell related how the bars of the display had to be pried open with a crowbar to remove the jewels. Due to lack of space, we cannot include many of the 40+ other fascinating speakers and topics. Among them were Chris Sellors and Rebecca Tucker, who talked about the gemstones of Britain, including Whitby Jet [see Feature Story in this issue], the Preseli Bluestone, from which the inner circle of Stonehenge was built, and the very rare Derbyshire Blue John, a naturally occuring fluorite, which is found only in a cavern in Castleton. Antoinette Matlins, globally respected gem and jewelry expert and author, discussed some of the ‘sting’ operations she has been involved with, which were carried out by national news organizations to expose unethical gem claims in the industry, whether in diamonds or gemstones. She also demonstrated tools that can be used to help identify gems and determine if a stone is real. It was clear after attending the seminar give by Mark Brown that he is passionate about pearls. A host on JTV, he is its resident pearl expert, and offered his audience an overview of the types of pearls and where they are from. Globetrotter Jay Boyle racks up thousands of miles a year in search of the best gemstones for JTV’s customers. A gem dealer since 1980, he talked about his experiences in visiting gem sources around the world and how JTV provides valuable information on its website for consumers regarding gem treatments and other information in the goal of transparency in the gem and jewelry industry. The gems of Brazil made up the informative topic by Clement Sabbagh, a second-generation dealer in precious Brazilian gems, who is often a guest host on JTV. Sabbagh also discussed gem treatment and the importance of disclosure when purchasing any gemstone. Well-known gem expert and journalist, Gary Roskin, host of the Roskin Gem Report, and recently appointed as Executive Director of the International Colored Gemstone Association, spoke on the state of the gem and jewelry industry. The GLC was indeed an interesting, informative, and enjoyable experience for the attendees, the speakers, and the staff at JTV. The foyer at JTV's headquarters in Knoxville, Tennessee, and one of the many displays featuring gems, minerals and jewelry. The star of the hit TV series, Prospectors, Amanda Adkins shared stories about her many amazing experiences as a miner in Colorado. The citrine and the silver for the necklace she is wearing were both mined by her. Jewelry designer Remy Rotenier poses with one of GLC's pets during the opening day shopping experience. Alexander Kreis discussed the types of cuts made by his family brand, whose tradition in gems and jewelry goes back 500 years. 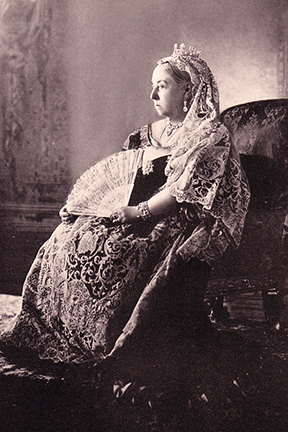 Portrait of Queen Victoria, who had a small non-Coronation crown made for her that was lighter and easier to wear during formal functions. 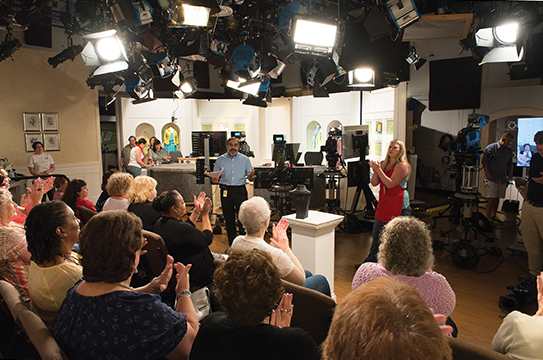 Some of the attendees enjoyed sitting in on one of the JTV on-air shows during the Gem Lovers Conference. Antoinette Matlins showed attendees how to use various tools that can help in identifying certain gemstones. JTV show host, Wendy Williams (left) and author Adrienne Weinfeld- Berg shared a few moments of relaxation during the Gem Lovers Conference in Knoxville.